Step 2: Take VOSAP volunteer pledge as individual volunteer at – https://www.voiceofsap.org/pledges/add-pledge/. The submission should be up to 2,000 words in text format with Figures, tables, charts and photographs (if any) in the upload word document. The candidate must certify the originality of the essay submitted while submitting their entry. After submission, till last date of submission, they can change and resubmit if needed. The Competition is open for submission of essay online till September 30, 2018 till 11:59 pm IST. The successful selected candidates of Round 1 will be informed to enter in Round 2. In this round candidate will share his/ her essay on social media from our website. This round will be parallel to round 1 and 2 (Aug/Sep/Oct 2018). Aim of this round is to increase participation for social cause of VOSAP. 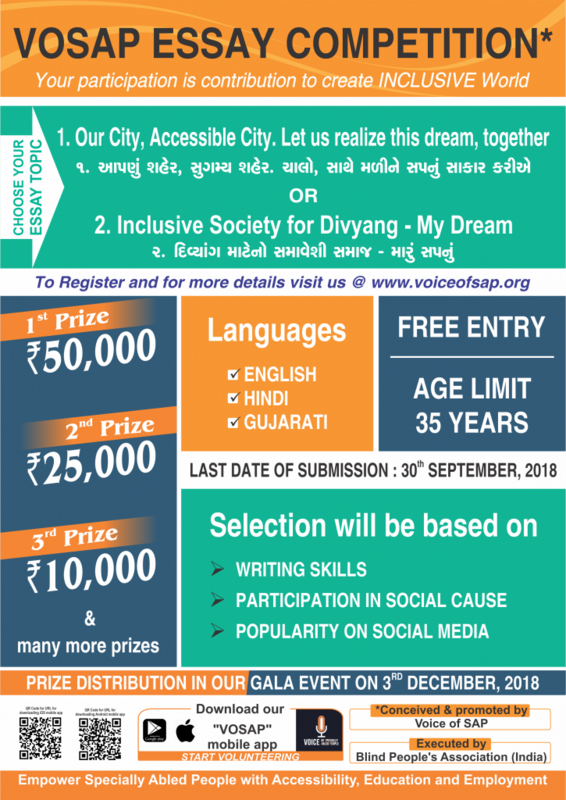 As subject of Essay is “My Dream”, participant will have to contribute towards achieving that Dream by means of taking photographs of building entrances in VOSAP mobile app, doing the star rating. Also, inspiring friends and family to take VOSAP pledge which is available on VOSAP mobile app. Candidate will get 5 points each for approved Photograph and 10 points each for inspiration of each pledge taken by others. Participant will be allotted points under three sections as explained below. On assessment of Essay, Points will be given by eminent Jury. For each FB like, candidate will get one point then will be adjusted per percentile. Highest point person will get 100 points and others will be in the ratio. Final selection will be done by considering total points obtained by participant. Decision of Voice of SAP for selection of winners of Essay Competition will be final and binding to all participants. Voice of SAP reserves the right to use all the submitted entries for whatsoever purpose they deem fit.